Social Street S2 is in fact a Thai restaurant located in Hutt Street, Adelaide. Open for only four months, the owners made up the name as they wanted it to be a place of social gatherings. A place to grab a drink and nibbles. But that has evolved and they found that more and more people were staying for dinner. Polly, the chef from Bangkok, has developed an authentic Thai menu, which we sampled. For entrée we tried the fish cakes, home made sweet chilli sauce with peanuts and cucumber. 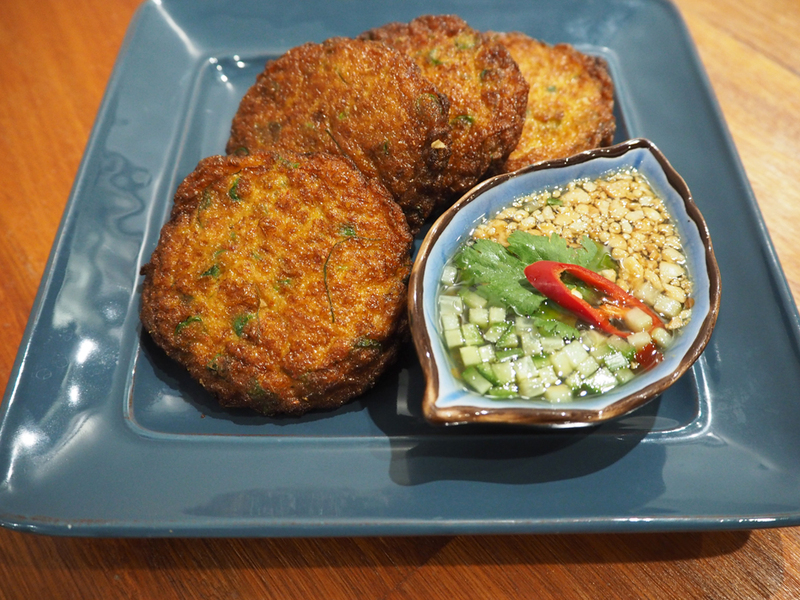 The fish cakes were dense and full of flavour with a tang from the kaffir lime leaves. And the sauce was fresh and spicy. 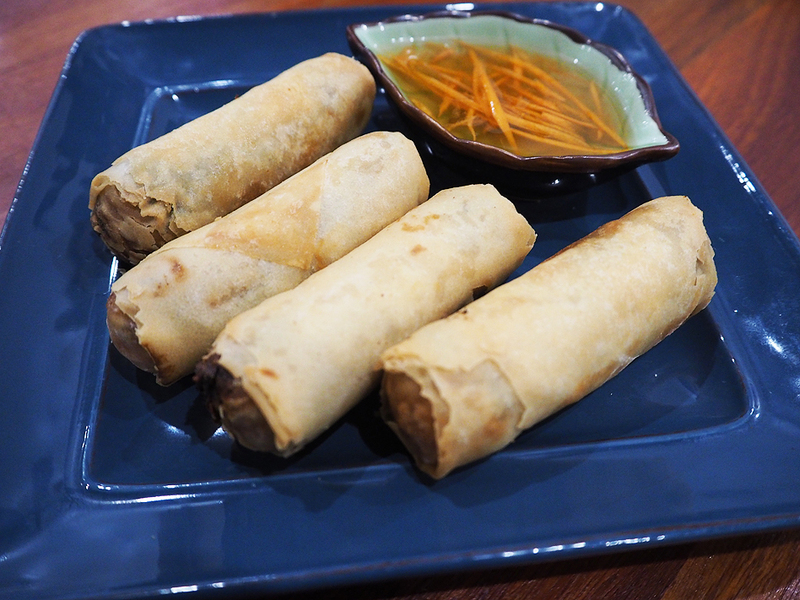 Also for entrée, vegetarian spring rolls. Hot and crunchy with a home made sweet tangy plum sauce. And the star of the entrees is the sea flower. This is a beautiful looking dish. 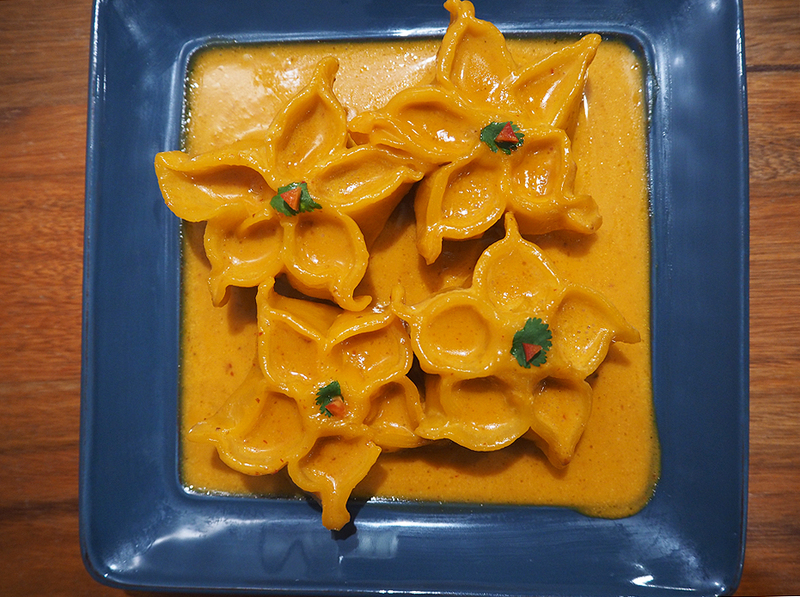 Encased in the dumpling pastry, a combination of chicken, squid and prawn meat in a mildly spicy red curry sauce. This is so moreish! The entrees were accompanied by The Other Wine Co 2015 Pinot Gris from the Adelaide Hills. For main course we were given a chilli plate to accompany our dishes. Chilli sauce. The most spicy. With kaffir lime leaf. Soya bean chilli. Similar to the seafood sauce, with a lot more chilli with a flavour of soya bean. 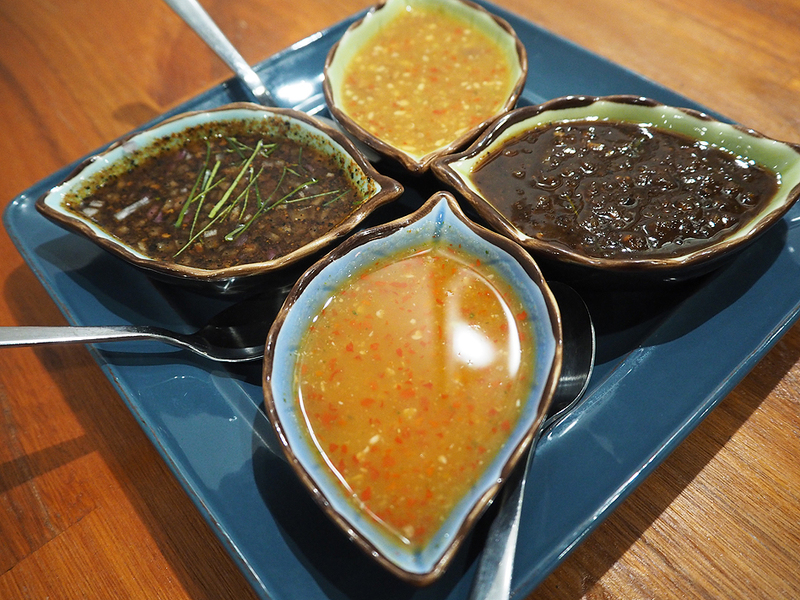 Tamarind chilli sauce. Slightly sweet. Seafood sauce. Contains lots of garlic, chilli and coriander. 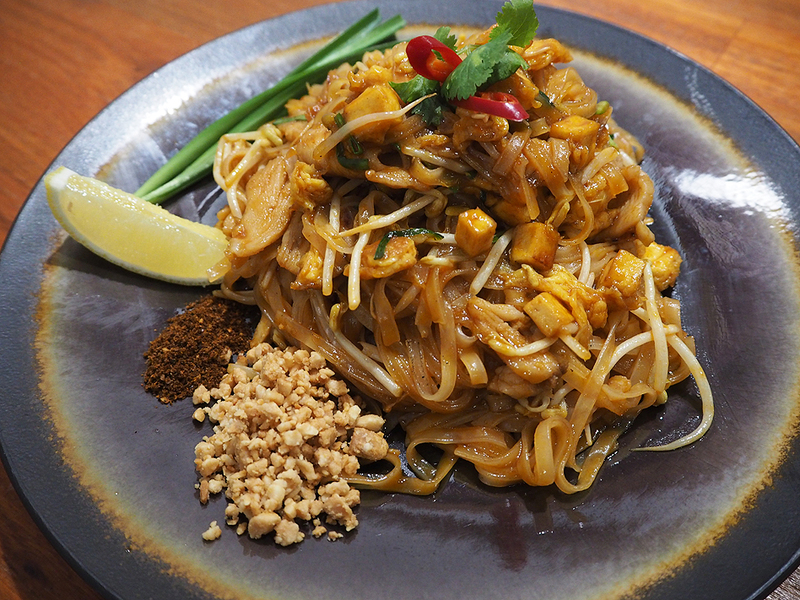 Chicken Pad Thai with rice noodles, bean sprouts, chives and crushed peanuts. The homemade sweet chilli sauce is used to stir fry the noodles in, giving them a good depth of flavour. The crushed peanuts and homemade chilli powder are served on the side for the diner to add if they wish. 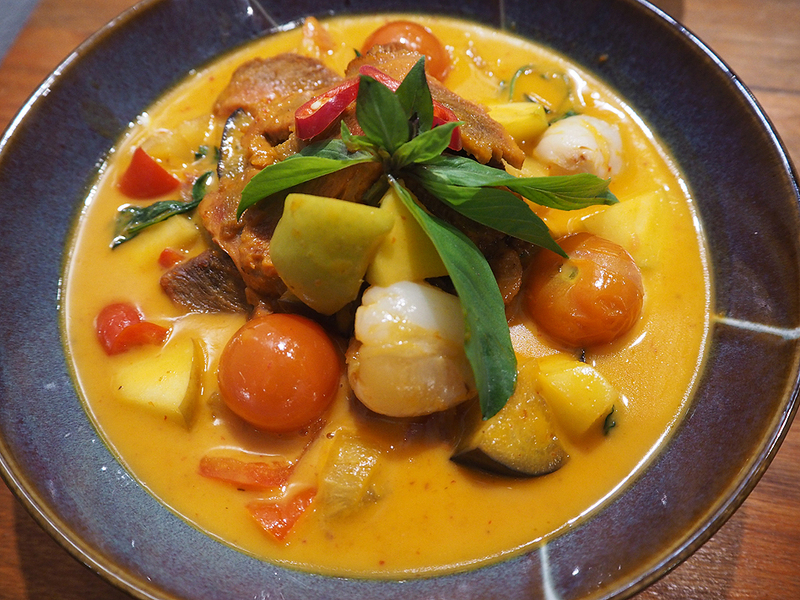 One of my favourite dishes was the roast duck curry with lychees, pineapple, cherry tomato, eggplant and tender slices of duck all served in a red curry sauce. The duck was so tender and once again the red curry very moreish with a little heat to it! I didn’t mind the fruit in the curry – it added a lovely sweetness and a little coolness. This was served with coconut rice. 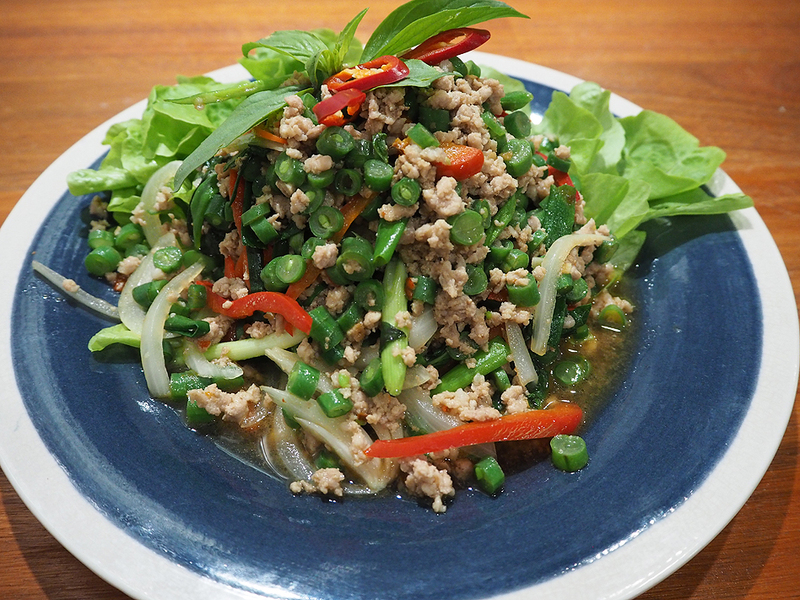 Phat krapow moo sab is an authentic Bangkok style stir-fried pork mince with basil and eaten with rice. It was tender, with lots of flavour. 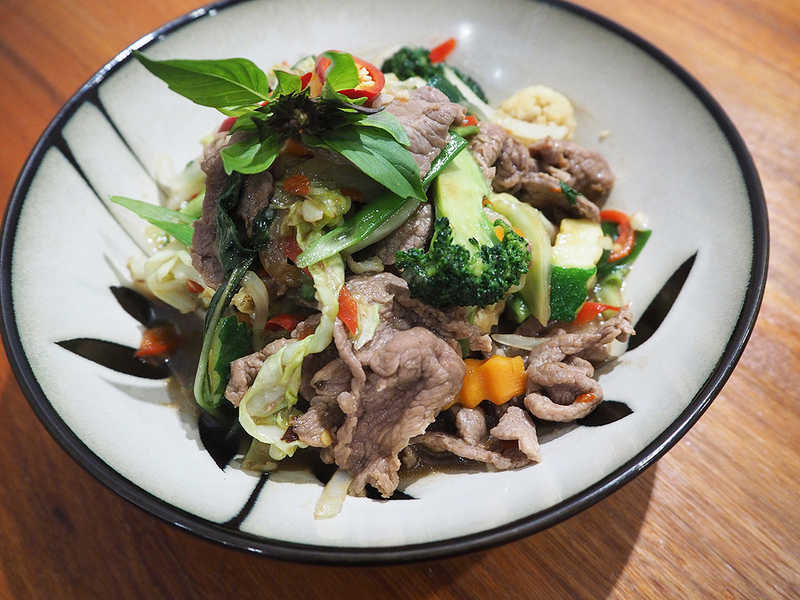 The basil beef with onion, spring onion, capsicum, assorted veggies with thai spicy sauce, was tender with a little heat to it. The vegetables were crunchy. 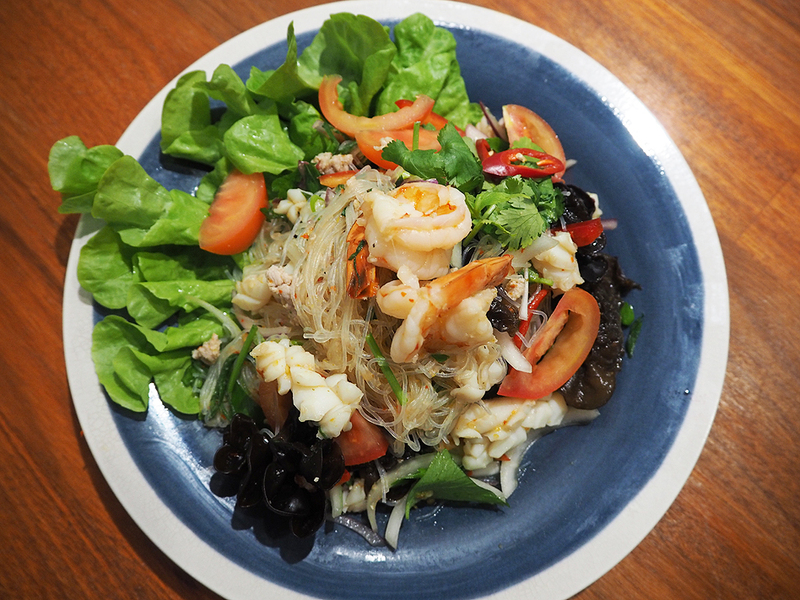 The clear noodle salad with mince pork, prawns, black fungus, squid, chinese celery, tomato with lime chilli dressing was probably my least favourite dish of the night and the black fungus was certainly a different texture. Soft and chewy with not much flavour and I didn’t like the feel of it in my mouth. 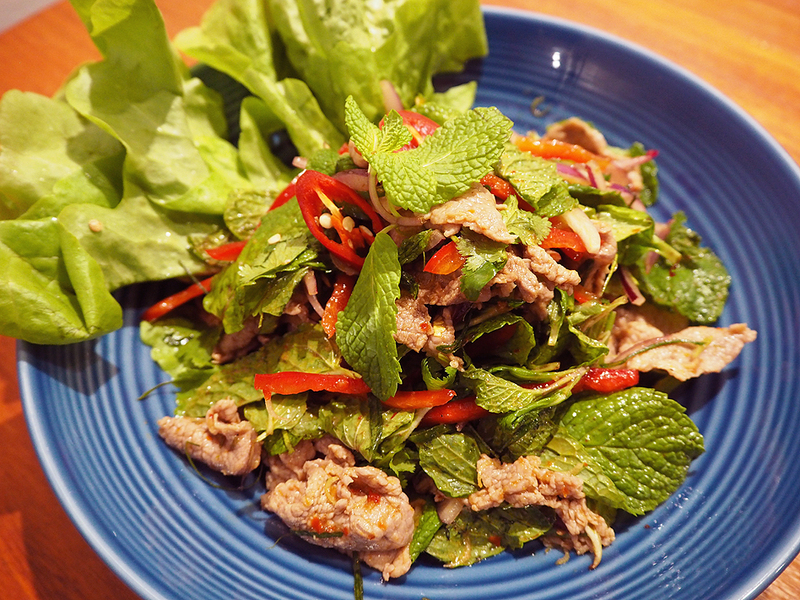 The pla beef contains lemongrass, kaffir lime leaf, red onion, spring onion, mint and street pla sauce. The mint added freshness to the dish to offset the spicy sauce. And the signature dish – plar rad prik. 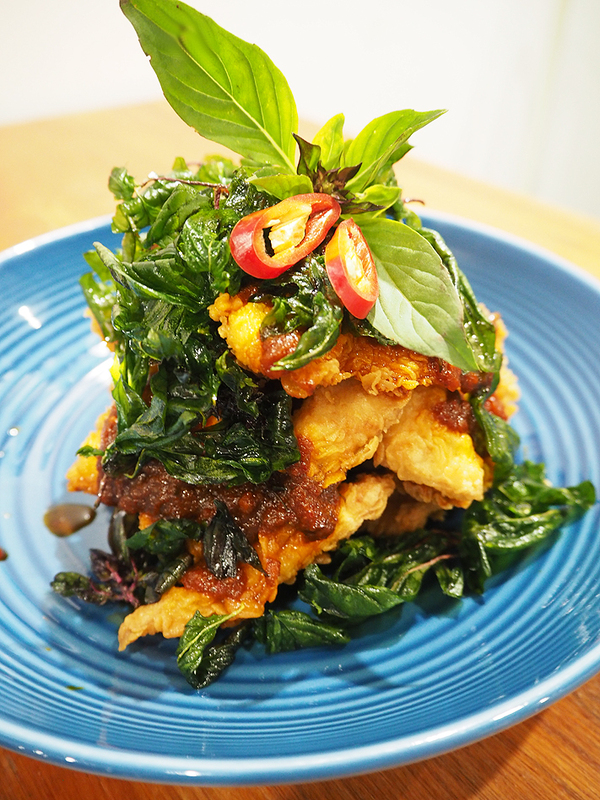 John dory fillet deep-fried with Social Street sauce. This was the best dish of the night and no wonder it’s their signature dish! The fish was soft and flaky and the batter crispy with added crispness from the deep-fried basil. The sauce similar to the red curry sauce, very moreish, but with a secret ingredient. The main courses were served with Rockbare 2013 Shiraz. 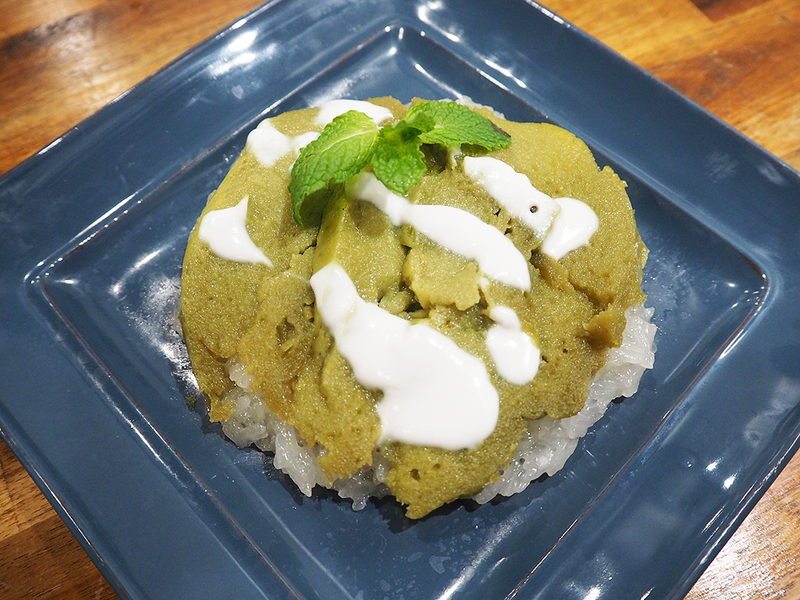 And we were so full we all shared a dessert – warm coconut sticky rice with Thai custard. It’s green comes from the bamboo flavour! With a little coconut milk on the top. Social Street S2 also do takeaway and deliver to 99 suburbs and will soon start weekend breakfasts! ** I was an invited guest. With thanks to Tempting Palates.